In the past, most of the times I found myself in situations I thought were risky or dangerous, it was because of a result of inexperience. Judgment and experience are of key importance in our world of aviation. When I turned 16 my grandfather sold me his old pickup truck. It cost me 300 bucks and was in nearly perfect condition with very low miles. I thought I was on top of the world. I spent all my spare time cruising the rural back roads of the little farming communities I grew up around. Any spare cash I had was spent at the filling station. I was pretty sure my driving skills were top notch and I kept the accelerator pedal pressed to the floor most of the time to keep up my skills. The old truck slid around corners nicely and I got comfortable with my ‘Dukes of Hazzard‘ style driving. No one could tell me I wasn’t in perfect control. I loved that old truck and couldn’t imagine being without it. Three months went by, and one fall evening I rounded a corner on a dirt road and started skipping over rough washboards. I lost control of the truck and crashed into a huge boulder. After rolling over once, I landed on the wheels. These were the days when seat belts got shoved under the seats before the truck left the showroom and were never seen again throughout the life of the truck. I vividly remember bouncing around in slow motion inside the cab of the truck during the rollover. I was rattled, but not hurt. I was embarrassed, scared and humbled and I spent a few sleepless nights thinking about how stupid I had been. I only had liability coverage, so the accident was a total loss for me. My careless and reckless behavior had cost me the truck. I was beginning to realize I was not as good a driver as I thought I was. My father explained the way insurance companies view an accident and that I could expect higher rates in the future. I was shocked to learn that my rates would increase because I knew that I had just learned the hard way to be a better driver. I suddenly had better judgment and more respect for the dangers of driving. I have often thought about how this incident influenced my life and changed my perspective, including my judgment as a driver. I’ve also thought a lot about how this is a common thread in all our lives. We often seem to learn lessons the best from bad experiences. It might not always be from irresponsible actions like my truck adventure, but poor judgment often times stems from inexperience. This is the tricky part of aviation. Experience certainly is the best teacher, but it needs to be balanced with knowledge and skill. A simple example of this might be a good VFR pilot having the confidence to try flying in the clouds. No matter how good you are, without training and experience, you are in no way prepared for instrument flying. Attempting to do so will likely result in very bad things, possibly even death. However, with training and some hand-holding, you can quickly gain the skills. Nearly every circumstance is more complicated than it seems and the only way to understand it fully is through experience. There must be some method of balancing experience and judgment. Most seem to err on the conservative side. Ultimately, we have to put our skills to work and start banking experience. Years ago, I flew a “B” model 421 for a local company. This was an exciting opportunity for me to accumulate some high-quality multi-engine time. I had limited experience in this type of airplane and barely met the insurance requirements. I was a contract pilot and charged by the hour for my time. Usually, the trips came up with little or no notice but were not too far away. However, the trips never seemed to go the way they were planned. Often, the itinerary would be changed several times before my return back to home base. This made planning for anything else in my life difficult, but I was anxious to accumulate as much multi-engine time as possible. Especially time in the 421. It was challenging, exciting and fun, and I felt like it was valuable time in my logbook. I felt lucky for the opportunity to fly the 421, even though it was often very frustrating dealing with all the uncertainty and lack of concern for my needs and schedule. Pressurization, twin turbocharged engines and complex systems made the 421 a desirable aircraft to fly. I quickly developed a real love for this awesome airplane. It was fast, carried a good load and introduced me to aspects of flying I had not experienced before. I learned to fly the 421 quickly, but in truth, did not have enough experience or training to make me as competent as I should have been. On one occasion, I was asked to fly a small group of people to Livingston, Montana. After dropping them off there, I would return home empty. I was assured it was a quick up-and-back assignment. It was 3 PM. I did the mental math, determining that I could get home by 6:30 or 7. I would be in time for a planned family event if I didn’t delay. The weather was perfect, the aircraft was fueled up and I was pleased to get a chance to fly back empty, without any passenger responsibilities. I have always enjoyed the solitude of flying alone. The flight to Montana was unbelievably smooth, especially considering the summer thermal activity that seems to always affect afternoon flights. We arrived late in the afternoon, not a soul in sight at the airport. As the owner of the company got up to exit the aircraft, he tapped me on the shoulder and complimented me on a pleasant flight. He also added, “I need you to wait for a few minutes and take a passenger back with you”. I immediately grew tense, knowing that this flight would probably end not as planned, but just like every other trip I had made for this company. I wandered over to the FBO feeling angry. Once again, I had been sucked into more than I had agreed to. Luckily, the lobby portion of the FBO had been left unlocked when workers had gone home. I plopped myself down on the couch. I assumed I would be waiting for a couple hours, even though I was assured it would be just a few minutes. I called my wife, and like so many other times gave her the news I would be late and unable to be at our engagement. As always, she was understanding and supportive, but disappointed. I had worked in the shop all day, so I was tired. By this time of the day I was also hungry, and now, frustrated and angry. The early evening atmosphere at the airport was peaceful and quiet. Not a single airplane landed or took off the entire evening. The cool summer breeze had a nice calming effect on me for a while. I spent some time wandering around the airport, poking around the hangars and seeing what I could see. Hungry, I looked for something to eat but there was nothing, not even a vending machine anywhere. Bored, I made a few calls until my phone battery went dead. Tired, I tried to relax, but I was too keyed up and restless. I read every magazine on the coffee table, waiting and waiting. The hours rolled by and my frustration grew. By midnight I started wondering if there had been some sort of misunderstanding. How could they leave me here with no word? How could they be so inconsiderate? Did something happen? All the thinking only led to more anger and unsettled feelings. At 2 AM, I finally heard a car pull up and two men emerged. I heard a “Sorry we are so late” as I headed for the airplane, but I didn’t reply. I escorted my passenger on to the airplane and shut the door. The moonless night was a concern for me, as I knew that 14,000-foot mountains surround the area. The airplane was not really IFR ready, having a number of instrumentation issues. And I wasn’t instrument current either. All our flying in this aircraft was day VFR. I wasn’t excited about flying it at night, but here I was, faced with this situation. I taxied out and lined up on the dark runway, taking off only after thoroughly studying the chart. I was careful to plot out my route and know where the terrain was. I knew the MEAs and planned to follow the airways to keep me clear even though I was not on an instrument flight plan. Though confident in my abilities, I had become uncomfortable with the upcoming flight. But I didn’t want to show any uncertainty to my passenger. He was a helicopter pilot returning home from a stint on a fire contract. We didn’t talk a lot, but he seemed like a nice guy. The 421 took off gracefully as always and climbed out just like it should. I was glad to be headed home and put this experience behind me. I looked out at the louvers on top of the big 375 horsepower engines and could see the turbochargers glowing inside the cowlings. A sight that was normal, but a little eerie to be sure. About 10 minutes into the flight, my passenger, who was sitting next to me in the copilot seat, spoke. “You know you are taking me to Provo, right?” My stress level immediately went from high to off the scale. I had calculated my requirements for the trip and easily had enough fuel for my flight back to Skypark, where I had come from. There had been no real need to be watching the clock, and calculating fuel burn as precisely as I would normally for a longer flight. Provo was about 50 miles further, which was just far enough to put me next to my range limit. Recognizing this additional flight time would complicate my situation, my mind started doing the math. I did the calculations as closely as I could. I figured I could actually make the entire trip and return to Skypark with a 30-minute reserve. I have never been comfortable with a 30-minute reserve, especially at night. But I had been conservative with my numbers, so I pressed on with an open mind and began planning my strategy. The B model 421 is commonly referred to as a tip tank plane, and most of them have 5 fuel tanks with a combined capacity of about 225 gallons. Two are 50-gallon tip tanks and are considered the mains. All take offs and landings are to be done on the main tanks. 2 additional aux tanks, which are rubber bladders, are installed inside the wings. The 5th tank, called a nacelle tank, is installed just forward of the left wing locker and has about a 30-gallon capacity bladder. It holds fuel you can pump into the left main tank if needed, then cross feed to balance the fuel load. The 421 burns about 40 gallons per hour and cruises 200-225 knots depending on your power settings. One other important fact about the fuel system on a 421 is that more fuel is being delivered to the engines than they can use. The excess fuel is returned to the main tank on its respective side. 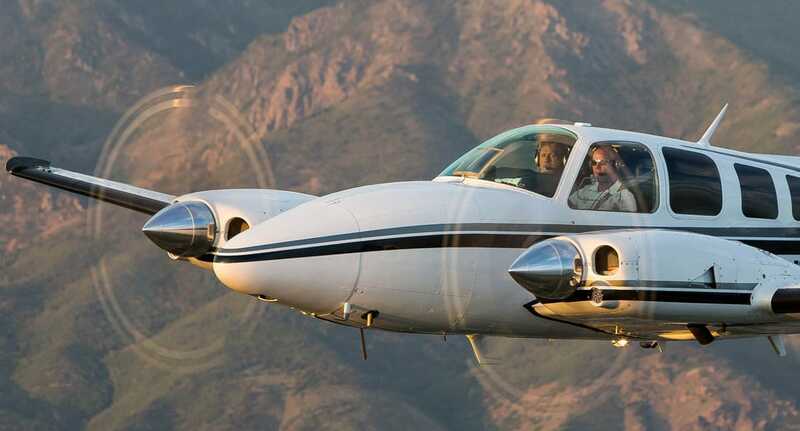 This creates a situation pilots need to be aware of when operating these aircraft. With full tanks, you depart and run for a period of time on the mains. Excess fuel is returned the same tank as it is being drawn from, but then you switch to the aux tanks in order to keep plenty of fuel in the mains for landing. During this time, fuel is leaving the aux tank and most of it is being burned in the engine. But the excess is going to the main tank on that side. You can see there’s a need to run long enough on the mains initially to create enough room in the tanks for that extra fuel. The only effective way to get the maximum range on the 421 is to run the aux tanks dry. This way, you know there is no unused fuel sitting around in them. It may only take an hour, or slightly more, to empty the aux tanks. This does not inspire confidence with passengers, and so I only did it when I really needed the aircraft’s full range. Using this technique, you can calculate how many hours you have flown, knowing the combined total of both the main and aux tanks in each wing. Once the engines start sputtering from lack of fuel, you quickly switch back to the mains and proceed on, confident with your calculations. What all this means is you have to pay attention carefully to flight times, power settings, climb rates and leaning procedures. Back in the plane, I needed to figure out exactly how much fuel I had left. I switched to the aux tanks and made a plan. 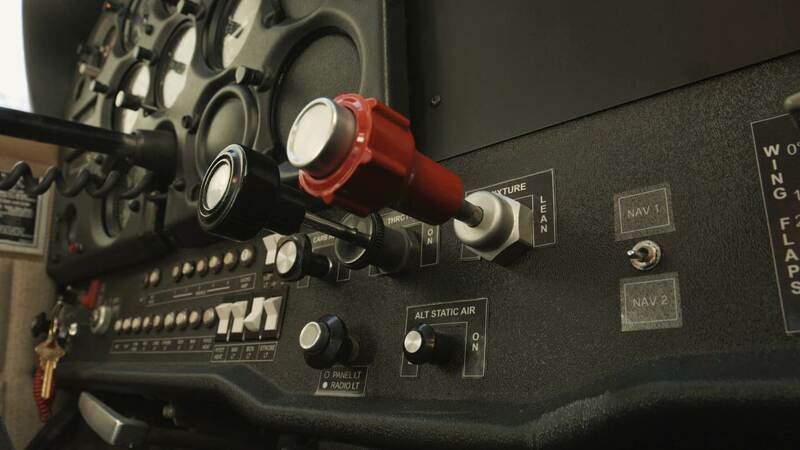 I would empty the aux tanks and if I could reach a predetermined point before that happened, I would proceed on, confident I would have enough to complete the mission without refueling. All my fuel would be in the mains and I would be able to dip the tanks in Provo before taking off again. If I couldn’t reach that point, I would go into Salt Lake and buy some fuel. I felt good about this decision and relaxed a bit, waiting for the time to pass. Several minutes later I noticed the fuel gauges were not responding the way I thought they should. I immediately discounted the accuracy of the gauges and muttered some complaint about how you can never rely on aircraft fuel gauges. As my estimated time grew close, I started anticipating the engines would begin sputtering any moment. I decided I would put one fuel selector back to the main position because I didn’t want both engines to run out of fuel at the same moment. I didn’t want to alarm my passenger. I waited and waited and nothing happened. At this point, I started to make some poor decisions. I began to switch selector positions on each side every few minutes with no real strategy, other than to try to get the aux tanks run dry. But things were not making sense to me. I began thinking maybe I had more fuel than I had imagined and that all the stress was unfounded. After a while, the left engine suddenly started running rough as it ran out of fuel. I was at 16,500 feet and only 10 miles from the Salt Lake Airport. I immediately switched tanks and started descending, requesting landing clearance from approach. I made the quick decision to get fuel because the conditions I had experienced over the past few minutes didn’t seem to make sense to me. I rapidly descended while completing a large S turn, arriving on final approach about 5 miles out. It was about 3 AM. I was relieved by my decision and feeling good with the welcoming approach lights and PAPIs guiding me in. But then suddenly the aircraft started yawing back and forth. The left engine again coughed and sputtered for a moment before quitting completely. I was about 3 miles out by now and didn’t feel like I had much time to try and figure out what had happened. My multi-engine training took over and I quickly ran through the procedures, feathered the engine and focused on landing the airplane. I didn’t feel too worried because everything seemed under control and I was only moments from touching down. I didn’t have the time or capacity in the dimly lit cabin to even try to do any troubleshooting. So I focused on flying and getting the plane on the ground. When the wheels touched the runway, I sighed in relief, knowing we were all right. I just couldn’t figure out why the engine had quit. My legs started shaking as the reality of what had happened set in. I had to call the FBO on the radio to come tow me since the aircraft could not be taxied in on one engine. Once parked, I said goodbye to my passenger who went to find a cab. He had handled the event without much input or obvious judgment about my skills. I was very confused and bewildered but thankful to be on the ground. I reentered the airplane to grab my headsets, and shined my flashlight around, checking things over. Inadvertently, I stopped on to the fuel selectors. My heart almost jumped out of my chest when I saw both of them pointing to the right main position. I had both engines running off the right main fuel tank. I sat there contemplating what had just happened. I was unable to explain why both engines had not failed. To this day, I do not have a good explanation. I was safe though and grateful for that. I got home and in bed by 4 AM, but couldn’t sleep. This continued for another night or two as I continued to replay the entire event over and over in my mind. We often hear about chains of events and how accidents happen not usually because of just one abnormal condition or problem, but a series of them. My evening was full of factors that all contributed to what ended up happening. I couldn’t see it as it was happening though and only later put all the pieces together. This same blinding condition occurs to a lot of people. I was tired, frustrated, hungry and angry. As it turned out, I was also unprepared for the mission. I had ample opportunities to stop the chain of events, but didn’t for some reason. Perhaps I was too easy going, or too agreeable or task oriented. Most likely I was simply unaware of how things were piling up on me. I couldn’t see what was right in front of me. Over the years I have developed some strategies to mitigate some of these tendencies. Here are a few observations of what I believe happened and what I might do differently had I to do it all over again. To begin with, I should have planned my trip differently from the very start. I knew the guy I was working with had a history of telling me what I wanted to hear when he asked me to do flights for him. I believed him when he told me this would be a quick round trip, but I had no real reason to do so. I should have grabbed an overnight bag and some food, even if it was just some snacks or candy bars and water. Any commercial pilot should recognize that plans quickly change in the aviation world and being prepared for those changes should be almost without thought. With some food, I could have eliminated one of the biggest contributors to poor pilot performance: hunger. When I accepted the mission, I should have realized there was every possibility I would not be getting home in time for the family event. Accepting this probability early would have helped in giving me a more resigned perspective rather than a frustrated and angry one. At the time the owner tapped me on the shoulder, I should have taken a more firm position. I should have either held him to his original commitment and let him know I would be leaving at a specified time, or at least committed him to update me at a particular time. I think we train others how to treat ourselves and allowing this type of unfair behavior only reinforces the abuse that often takes place. I was a lower time pilot willing to do almost anything to accumulate time, especially multi-engine time. But honest hard work pays off and good people who see your professional and ethical efforts to do a good job will recognize and respect it. Those who don’t respect your schedule and needs are not worth your time. I realize it’s easy to say this from a perspective looking back, but as seen from my example, there are many reasons to take this to heart. I see too many pilots who company executives take advantage of in many ways. There are diplomatic and professional ways to handle situations like this. Often, it can be as simple as a firm but friendly and respectful conversation that reinforces your pilot-in-command responsibility. After take off, when my passenger informed me of the flight plan changes, I could have reacted differently. I could have simply told him I did not have enough fuel to complete the flight as he had outlined. I never considered this possibility because I was very mission driven and felt an obligation to complete the job. I could have explained that I was tired, hungry and upset and that I would not continue on because I felt it unsafe to do so. He might have been angry but he also might have appreciated my honesty and accepted my rational and respectful explanation of the situation. My stress would have evaporated if I had made that decision early in the flight. The boss might also have been upset, but pilot-in-command characteristics dictate safe and responsible decisions. Honest, practical explanations are accepted and embraced by good people. During the flight home, after I switched tanks from the aux tanks, I noticed an inconsistency with the fuel gauges at least once. I should have stopped myself and asked why the indications were not doing what I expected them to do. I automatically jumped to a conclusion with no effort to consider other possibilities. 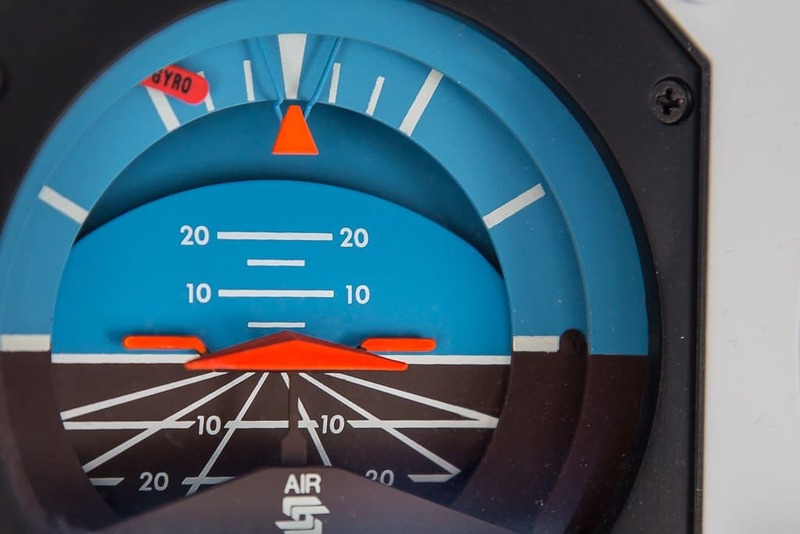 “You can’t trust aircraft fuel gauges”, but that doesn’t mean the gauges have no value. They were trying to tell me something was going wrong but I was unwilling or incapable of changing my train of thought. I believe I mistakenly turned both fuel selectors in a clockwise direction after my first attempt to empty the aux tanks. This was a change I made with no verification of my actions. During normal flight when main tanks are being used, the selectors are each pointed outward toward the wingtips. During aux tank usage, both selectors point forward. So when I turned them clockwise from that position, the right engine would have been using fuel from the right main tank and the left one cross feeding from the right tank also! Imagine how fast fuel would be drawn from that tank at a rate of 40 plus gallons per hour. This caused a rapid actual and indicated drop in fuel level on the right main tank and no change in the left. In no time at all, I caused myself a lot of confusion. Now I had no way of knowing how much fuel was in each side of the aircraft. And then I complicated it further by continuing to switch back and forth with no strategy. I should have kept it simple and I should have verified the accuracy of my actions. As a result of this traumatic experience, I never switch fuel tanks without a finger touch on the pointer and verbalizing the words “right main” or “left aux”, whatever the case. Possibly above all, the important lesson I learned from this experience is that when you sit in the pilot seat of the airplane and take off, you have to become a flexible person. When temperamental mechanical machines combine with fickle weather and unpredictable personalities, you have to be prepared and able to quickly change your plans and your mindset. If you are rigid and not adaptable, or unwilling to see things differently, you will run into circumstances that put you and your passengers at risk. When you can resign yourself to the current realities you are faced with, the difficult decisions become less stressful. Your mind is open, which allows improved performance and judgment. You have a greater ability to see outside the box. I have had years to contemplate this night that almost cost my life and the life of another. It’s a sobering thought, and for several years I kept the experience completely to myself. I was too embarrassed and troubled by it to share with anyone. The experience changed the way I fly and the way I make decisions in the airplane. I later recognized how valuable the lessons I learned were. I began to share my story in hopes that others would relate to and benefit from it. I am not proud of the job I did as a professional pilot that night. However, I feel satisfaction that from my poor judgment, I gained experience leading to better judgment. I was talking with a friend one day who is also a flight instructor. We were talking about teaching a student to land, and he said something that has stuck with me. “It’s not the bad landing that counts. What matters most is what you do next.” I have broadened the phrase to apply to more than just landings. Some of us prefer to hide our mistakes and pretend they never happened. But in order to become better, we have to let the experience be our teacher. I have seen many over the years who, like me, made some sort of error in judgment. Some resulted in serious accidents, others minor mishaps and still others, like mine, merely resulted in a close call. Some have let fear and anxiety take over their lives and change them for the worse. They let the experience paralyze them because of fear or guilt. They could never let go of the simple fact they are human and become unwilling or incapable of engaging in the future for fear something might happen. Others become so careful, their thinking becomes narrow and channeled. They start making more mistakes because they are unable to be open and aware of the big picture as they try to maintain careful and full control of every situation. Somehow, we need the ability to transition through all the emotions that accompany tragedy and mistakes. And ultimately, we have to take responsibility and learn the lessons that are there to learn. Through that process, we become better and develop wisdom.